The R-symmetry formalism is applied for the supersymmetric economical (3-3-1) model. The generalization of the minimal supersymmetric standard model relation among R-parity, spin and matter parity is derived, and discrete symmetries for the proton stability in this model are imposed. We show that in such a case it is able to give leptons masses at just the tree level. A simple mechanism for the mass generation of the neutrinos is explored. With the new R-parity, the neutral fermions get mass matrix with two distinct sectors: one light which is identified with neutrino mass matrix, another heavy one which is identified with neutralinos one. The similar situation exists in the charged fermion sector. Some phenomenological consequences such as proton stability, neutrinoless double beta decays are discussed. Although the Standard Model (SM) gives very good results in explaining the observed properties of the charged fermions, it is unlikely to be the ultimate theory. It maintains the masslessness of the neutrinos to all orders in perturbation theory, and even after non-pertubative effects are included. The recent groundbreaking discovery of nonzero neutrino masses and oscillations  has put massive neutrinos as one of evidences on physics beyond the SM. Since the data provide only the information about the differences in , the neutrino mass pattern can be either almost degenerate or hierarchical. Among the hierarchical possibilities, there are two types of normal and inverted hierarchies. In the literature, most of the cases explore normal hierarchical one in each. In this paper, we will mention on a supersymmetric model which naturally gives rise to three pseudo-Dirac neutrinos with an inverted hierarchical mass pattern. The gauge symmetry of the SM as well as those of many extensional models by themselves fix only the gauge bosons. The fermions and Higgs contents have to be chosen somewhat arbitrarily. In the SM, these choices are made in such a way that the neutrinos are massless as mentioned. However, there are other choices based on the SM symmetry that neutrinos become massive. We know these from the popular seesaw [4-14] and radiative [7-11] models. Particularly, the models based on the gauge unification group [12-23], called 3-3-1 models, give more stricter fermion contents. Indeed, only three fermion generations are acquired as a result of the anomaly cancelation and the condition of QCD asymptotic freedom. The arbitrariness in this case are only behind which SM singlets put in the bottoms of the lepton triplets? In some scenarios, exotic leptons may exist in the singlets. Result of this is quite similar the case of the SM neutrinos. As a fact, the mechanisms of the Zee’s type [7-11] for neutrino masses arise which been explored in Ref. .
Forbidding the exotic leptons, there are two main versions of the 3-3-1 models as far as minimal lepton sectors is concerned. In one of them [12-14] the three known left-handed lepton components for each generation are associated to three triplets as , in which is related to the right-handed isospin singlet of the charged lepton in the SM. No extra leptons are needed and therefore it calls that a minimal 3-3-1 model. In the variant model [15-18] three lepton triplets are of the form , where is related to the right-handed component of the neutrino field , thus called a model with the right-handed neutrinos. This kind of the 3-3-1 models requires only a more economical Higgs sector for breaking the gauge symmetry and generating the fermion masses. It is interesting to note that two Higgs triplets of this model have the same charges with two neutral components at their top and bottom. 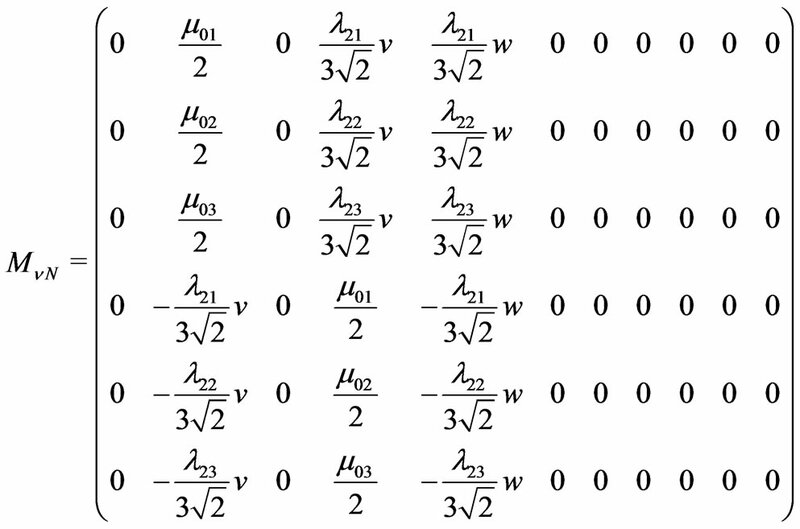 Allowing these neutral components vacuum expectation values (VEVs) we can reduce number of Higgs triplets to be two. Therefore we have a resulting 3-3-1 model with two Higgs triplets [27-28]. As a result, the dynamical symmetry breaking also affects lepton number. Hence it follows that the lepton number is also broken spontaneously at a high scale of energy. Note that the mentioned model contains very important advantage, namely, there is no new parameter, but it contains very simple Higgs sector, therefore the significant number of free parameters is reduced. To mark the minimal content of the Higgs sector, this version that includes righthanded neutrinos is going to be called the economical 3-3-1 model. Among the new gauge bosons in this model, the neutral non-Hermitian bilepton field may give promising signature in accelerator experiments and may be also the source of neutrino oscillations [25-26]. In the current paper, the neutrinos of the 3-3-1 model with righthanded neutrinos is a subject for extended study. The 3-3-1 model with right-handed neutrinos gives the tree level neutrino mass spectrum with three Dirac fermions, one massless and two degenerate in mass . This is clearly not realistic under the experimental data. However, this pattern may be severely changed by quantum effects and gives rise to an inverted hierarchy mass pattern. This is a specific feature of the 3-3-1 model with right-handed neutrinos which was considered in Ref. (see also ), but such effects exist in the very high level of the loop corrections. The outline of this work is as follows. In Section 2 we define the R-charge in our model in order to get similar results as in the Minimal Supersymmetric Standard Model (MSSM). While in Section 3 we impose another discrete symmetry that allow neutrino masses but forbid the proton decay and the neutron-antineutron oscillation. In Section 4 we calculate the fermion masses in our model, then we present some phenomenological discussion of this model. Our conclusions are found in the last section. In Appendix, we present the mass matrix elements of the neutral fermions. In the supersymmetric 3-3-1 model with right-handed neutrinos (SUSY331RN) [31-32], the R-parity was already studied and we have shown that if R-symmetry is broken, the simple mechanism for the neutrinos mass can be constructed . This mechanism produces the neutrinos mass which is in agreement with the experimental data. The supersymmetric extension of the economical 3-3-1 model (SUSYECO331) was presented in . The fermionic content of SUSYECO331 is the following: the left-handed fermions are in the triplets/antitriplets under the group, namely, the usual leptons are the triplets , ; while in the quark sector, we have two families in the antitriplets , , and one family in the triplet . The right-handed components are in the singlets under the group: , , , which are similar to those in the SM. In addition, the exotic quarks transform as . The coefficients and have mass dimension and can be complex variables , while all coefficients in are dimensionless, and . with this superpotential, we have shown that  the boson, Higgs sectors and the fermion one gain masses. Note that there is only VEV of given the charged leptons masses. As shown in Ref. , the mass pattern of this sector is 0, 0, , , , . Note that in this case, we have two massless neutrinos. Unfortunately, as in the nonsymmetric version, the quantum corrections at one loop level cannot generate the realistic mass spectrum to the neutrinos. To get the realistic neutrino masses, one have to introduce new physics scale or inflaton with mass around the GUT scale [37-38]. In this article, we will explore a new mass mechanism to generate neutrino masses at tree level for all neutrinos and study the flavor violating processes, such as neutrinoless double beta decay, which do not exist in our previous work. This R-charge is different from those presented in Ref. . We will show that in this case, there exist some new phenomena, which are previously not allowed. where is defined in Equation (12). The superpotential given in (22) will not only allow some interesting flavor violating processes but also will simultaneously give the nucleons a stability. As we will show in next section, this superpotential will also generate masses to all neutrinos in the model. With the above terms, we get the mass matrices for the neutral and charged fermions. 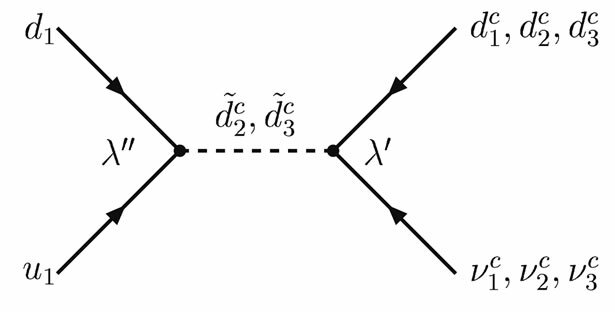 Diagonalizing these matrices we obtain the physical masses for the fermions. Firstly, let us study the neutral fermions masses. where matrices and are presented in Equations (52) and (54). and the value of g is given in Ref. . In the Equation (29), there are some negative eigenvalues. In order to obtain the positive mass, the eigenstates need to be redefined by the chiral rotations. Equation (29) shows that we have two very distinct sector, one contains the light neutral fermions that we will associate with the usual neutrinos in the SM and the other one contains the heavy neutralinos. The lightest neutralino mass equals to 57 GeV and it is consistent with limits on inelastic dark matter from ZEPLIN-III . These results can be understood as follows: Because of the interference matrix between the neutrino mass matrix and the neutralino mass matrix, all neutrinos gain mass at the tree level. This change of the neutrino mass spectrum is suitable to experiment data. Thus the neutrino mass spectrum in the model under consideration depends on the choice of -parity. Now we deal with the charged fermions. where is the particle and is the anti-particle . It is easily to see that the mass matrix is divided in two sectors: one heavy which is identified as the charginos and has been studied in our previous work . Another one light which is identified as the usual leptons. In this case, the new elements put down masses of the muon and tauon and at the same time remove the mass degeneracy between and . Anyway we can see that the mass matrix in the charged fermion sector is basically divided in two sectors: one giving masses of the usual known leptons and another one giving masses of the new charginos. 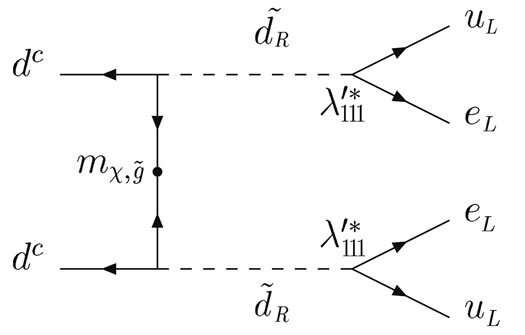 Here we have suppressed indices, is the antisymmetric tensor. Above, and below in the following, the subindices run over the lepton generations but a superscript indicates charge conjugation; denote quark generations. Note that the -coupling in the MSSM is similar to the -coupling in the most general form of the superpotential in the SUSYECO331, which is given in Equation (10), and the coupling is similar to the coupling . Taking into account Equations (45) and (46), we can draw two Feynmann diagrams describing the proton decay, which are shown in the Figures 1 and 2. The Figure 1 describes the proton decay into charged leptons. At the lowest approximation, there is no mixing in the quark, neutrino and squark sectors. It means that , and and so on. The proton could decay into , and , but the last two modes are forbidden kinematically. Figure 1. Proton decay into charged leptons in the MSSM and in SUSYECO331 (with and ). Figure 2. Proton decay into antineutrinos in the MSSM and in SUSYECO331 (with and ). where the proton decay into antineutrino, have been considered in . The mentioned decay modes are , , 1. In these cases, we get the same numerical results as presented in Equation (48). The bound presented in Equation (48) is so strict. So the natural explanation only is that at least one of the couplings has to be zero. In order to avoid that the simplest way is to impose the R-symmetry. This leads to avoid the proton decay. In our superpotential given at Equation (22), we allow only interactions that violate L-number. Therefore the proton is stable at tree-level. However it is not only forbidden the dangerous processes of proton decay but also forbidden the neutron-antineutron oscillation. This oscillation was studied in detail in [52-55]. In [45-46], in the framework of the supersymmetric 3-3-1 model with right handed neutrinos, the R-parity violating interaction was applied for instability of the nucleon. The result is consistent with that of the present article (noting that in Ref. [45-46], the authors have taken a lower limit of the proton lifetime equal to 1032 y). Figure 3. Neutrinoless double beta decay in SM with massive neutrinos. decay with massive Majorana neutrino exchange between decaying nucleons it implies an upper bound on the neutrino mass below 1 eV.
. The relevant experimental situation corresponds to a parent nucleus whose beta decay channel, , is energetically closed, but which is allowed to decay to the daughter nucleus, , via the two-step beta decay process involving virtual transitions to the neighboring nucleus, . The double beta decay processes probe the nuclear structure through the nuclear ground state matrix elements of two-current correlation functions. Only the regular double beta reactions have been experimentally observed so far, while active searches are currently pursued for the reactions, which offer sensitive probes of new physics. Figure 4. Neutrinoless double beta ( ) decay in the MSSM with massive neutrinos and in SUSYECO331 (with ). ture experimental projects can be found in Ref. . The supersymmetric mechanism of decay was first proposed by Mohapatra  and later studied in more details in Refs. [64,65]. In Ref. it was shown that the gluino exchange contribution to -decay leads to a very stringent limit on the first generation parity violation-Yukawa coupling Recently, Babu and Mohapatra  found another contribution comparable in size with the gluino exchange. It allows one to set stringent limits on combinations of the intergeneration R parity violation-Yukawa couplings such as , where denotes generations, see Fiure 4.
with and denoting squark and gluino masses, respectively, and with the assumption . This result is important for the discussion of new physics in the connection with the high―Q2 events seen at HERA. The analyses presented in the MSSM to the neutrinoless double beta decay are still hold in the SUSYECO331 model, because the is allowed in our superpotential as shown at Equation (22). 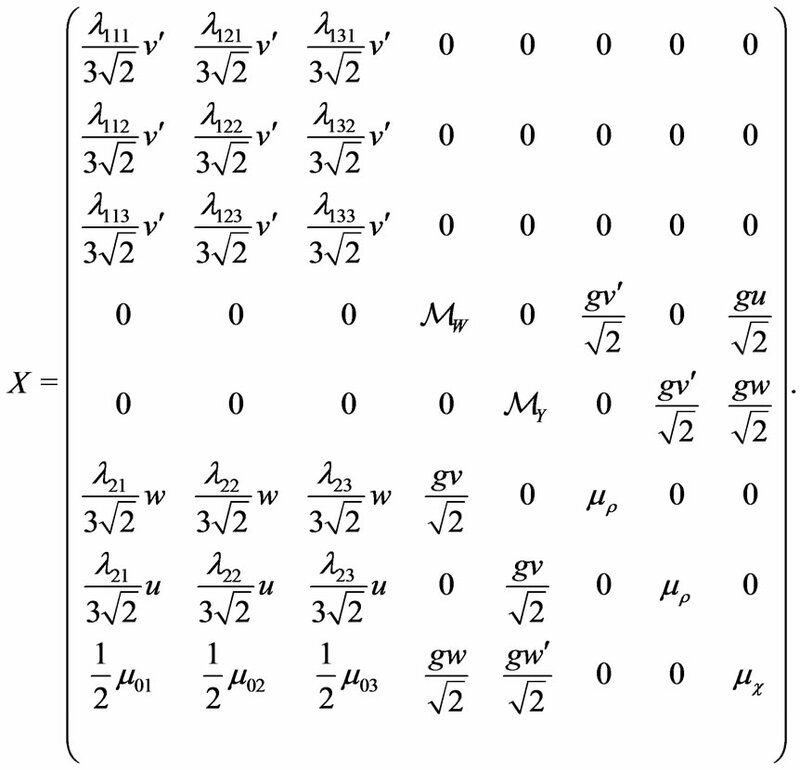 In this paper we have presented new R-symmetry for the supersymmetric economical mode and studied neutrino mass by implication for the obtained R-parity. The neutrino mass spectrum is affected by the chosen R-parity. By imposing the R-parity, namely: , the neutrino mass spectrum at the tree level contains two massless. We remind that in the non-supersymmetric economical 3-3-1 model, to give neutrinos a correct mass pattern, we have to introduce new mass scale around the GUT scale. The same situation happens in the supersymmetric version and the above puzzle can be solved with the help of the inflaton having mass in the range of the GUT scale. In this paper, we have showed that by the chosen R parity and the set of parameters, the pseudoDirac neutrino mass is available. We have found that the other R-parity given in (21) leads to the interference between the neutrino and neutralino mass matrices. 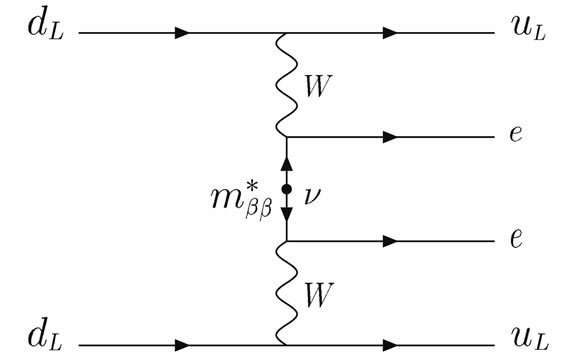 Because of this interference mass matrix, all neutrino gain mass only just at the tree level and the interference mass matrix does not much affect on the neutralino mass spectrum. In the charged lepton sector, with the new R-parity, there is also an interference mass matrix between the usual leptons and charginos. By taking the numerical, we show that the charged sector is basically divided in two distinct sectors: one giving the usual known leptons and the other ones given the new charginos. If we ignore the interference charged lepton mass matrix, the chargino mass spectrum is degenerated. This degenerated mass spectrum is removed by imposing the new R-parity. The new R-parity not only provides a simple mechanism for the mass generation of the neutrinos but also gives some lepton flavor violating interactions at the tree level. This will play some important phenomenology in our model such as the proton’s stability, forbiddance of the neutron-antineutron oscillation and neutrinoless double beta decay. M. C. R. is grateful to Conselho Nacional de Desenvolvimento Cient fico e Tecnológico (CNPq) under the processes 309564/2006-9 for supporting his work, he also would like to thank Vietnam Academy of Science and Technology for the nice hospitality, warm atmosphere during his stay at Institute of Physics to do this work. This work was supported in part by the National Foundation for Science and Technology Development (NAFOSTED) under grant No: 103.01.16.09. T. Araki, et al., “Measurement of Neutrino Oscillation with KamLAND: Evidence of Spectral Distortion,” Physical Review Letters, Vol. 94, No. 8, 2005, pp. 081801- 1-081801-5. J. Schechter and J. W. F. Valle, “Neutrino Decay and Spontaneous Violation of Lepton Number,” Physical Review D, Vol. 25, No. 3, 1982, pp. 774-783. C. A. de S. Pires and O. P. Ravinez, “Charge Quantization in a Chiral Bilepton Gauge Model,” Physical Review D, Vol. 58, 1998, pp. 035008-1-035008-5. J. C. Montero, C. A. de S. Pires and V. Pleitez, “Neutrino Masses through a Type II Seesaw Mechanism at TeV Scale,” Physical Review B, Vol. 502, 2001, pp. 167-170. T. Kitabayashi and M. Yasuµe, “Two Loop Radiative Neutrino Mechanism in an SU(3)L × U(1)N Gauge Model,” Physical Review D, Vol. 63, No. 9, 2001, pp. 095006-1-095006-6. P. V. Dong and H. N. Long, “The Economical SU(3)C × SU(3)L × U(1)X Model,” Advanced High Energy Physics, Vol. 2008, 2008, pp. 739492-739567. D. T. Huong, M. C. Rodriguez and H. N. Long, “Scalar Sector of Supersymmetric Su(3)C × Su(3)L × U(1)N Model with Right-Handed Neutrinos,”. D. T. Huong and H. N. Long, “Neutralinos and Charginos in Supersymmetric Economical 3-3-1 Model,” JHEP07, Vol. 2008, 2008, pp. 049-1-049-17. 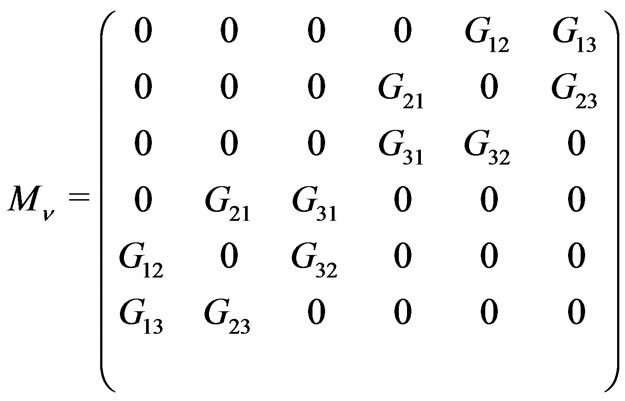 D. T. Huong and H. N. Long, “Non-thermal Leptogenesis in Supersymmetric 3-3-1 Model with in Ationary Scenario,” Journal of Physics G: Nuclear and Particle Physics, Vol. 38, No. 1, Article ID: 015202. D. Yu. Akimov, et al., “Limits on Inelastic Dark Matter from ZEPLIN-III,” Vol. 692, No. 3, 2010, pp. 180-183. M. Capdequi-Peyranµere and M. C. Rodriguez, “Charginos and Neutralinos Production at 3-3-1 Supersymmetric Model in e-e Scattering,” Physical Review D, Vol. 65, No. 3, 2002, pp. 035001-1-035001-16. P. Fayet, “Supersymmetry and Weak, Electromagnetic and Strong Interactions,” Physical Review B, Vol. 64, No. 2, 1976, pp. 159-162. P. Fayet, In: A. Perlmutter and L. F. Scott, Eds., New Frontiers in High-Energy Physics, Proceedings Orbis Scientiae, Coral Gables, 1978, p. 413. H. Dreiner, “An Introduction to Explicit R-Parity Violation,” Pramana, Vol. 51, No. 1-2, pp. 123-133. J. L. Goity and Marc Sher, “Bounds on Delta B = 1 Couplings in the Supersymmetric Standard Model,” Physical Review B, Vol. 346, No. 1-2, 1995, pp. 69-74. M. Dress, R. M. Godbole and P. Royr, “Theory and Phenomenology of Sparticles,” 1st Edition, World Scientific Publishing Co., Singapore City, 2004. H. Baer and X. Tata, “Weak Scale Supersymmetry: From Superfields to Scattering Events,” 1st Edition, Cambridge University Press, Cambridge, 2006. G. Moreau, “Phenomenological Study of R-Parity Symmetry Violating Interactions in Supersymmetric Theories,” In French, arXiv: hep-ph/0012156. HEIDELBERG-MOSCOW Collaboration, A. Balysh, et al., “SubeV Limit for the Neutrino Mass from Ge-76 Double Beta Decay by the Heidelberg―Moscow Experiment,” Physical Review B, Vol. 356, 1995, p. 450. H. V. Klapdor-Kleingrothaus, “Double-Beta Decay And Related Topics: Proceedings of the International Workshop Held at European Centre for Theoretical Studies (ECT): Trento, Italy, April 24-May 5, 1995,” 1995, World Scientific, Singapore. M. GÄunther, et al., “Heidelberg—Moscow Beta-Beta Experiment with Ge-76: Full Setup with ve Detectors,” Physical Review D, Vol. 55, 1996, pp. 54-67. 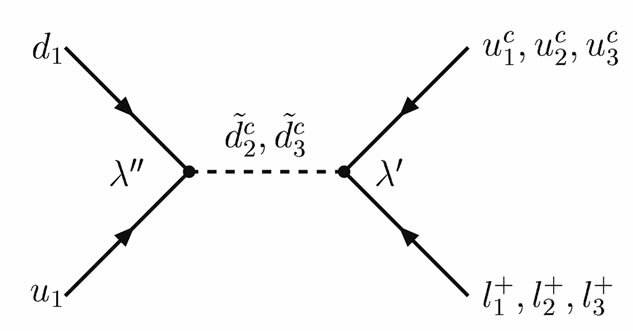 M. Hirsch, H. V. Klapdor-Kleingrothaus and S. G. Kovalenko, “New Supersymmetric Contributions to Neutrinoless Double Beta Decay,” Physical Review B, Vol. 352, No. 1-2, 1995, pp. 1-7. M. Hirsch, H. V. Klapdor-Kleingrothaus and S. G. Kovalenko, “On the SUSY Accompanied Neutrino Exchange Mechanism of Neutrinoless Double Beta Decay,” Physical Review B, Vol. 372, No. 3-4, 1996, pp. 181-186.
and is presented in . 1Again, we are bare mixing in the quarks, neutrinos and squarks sectors.